One of the pleasures of farm-life is raising your own turkey for Thanksgiving. Our turkeys (not yet for sale) are a unique heritage turkey --- unique because they are white yet can breed naturally (unlike the modern Nicholas White which dominates the supermarkets and requires artificial breeding and is too massive to mate naturally). 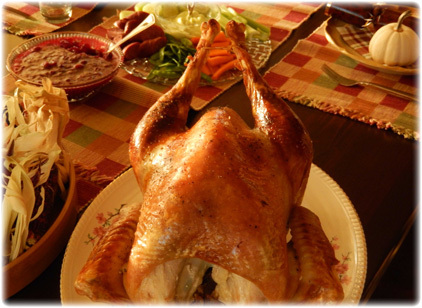 Ours is a sustainable turkey --- not only in terms of its genetics and its ability to breed naturally, but also in its ability to forage and grow slowly enough to avoid the health issues which affect conventional turkey growers. The terminal weight (i.e. 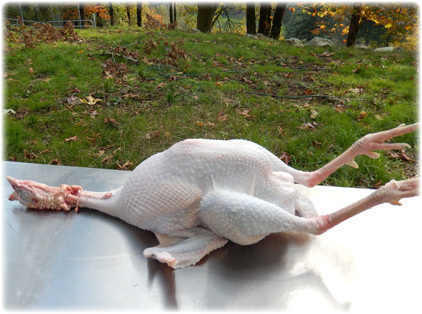 maximum full-grown weight) on a Sumas Mountain Farms turkey is approximately 25 pounds for the males --- the females are more like 15 pounds. This is dramatically lower than a modern conventional turkey such as the Nicholas White, whose maximum weight (if left) can be double that. Preparing for Thanksgiving on Sumas Mountain Farms means going down to the turkey run and selecting a tom, slaughtering him on the farm ourselves, plucking the bird in our automated plucker, eviscerating and preparing the carcass, and then roasting it once it has cooled and aged for a couple of days. Other than the electric plucker, everything is done exactly as our ancestors would have done it. Here are some pictures of the process, and the finished bird. We have so much to be thankful for. Happy Thanksgiving to all of you! 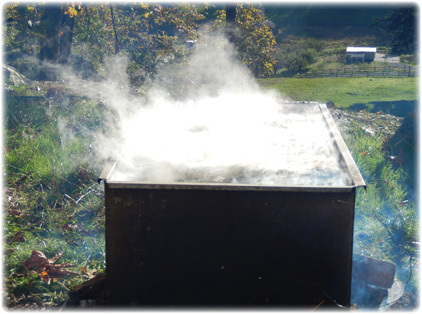 This is a scalder of hot water. 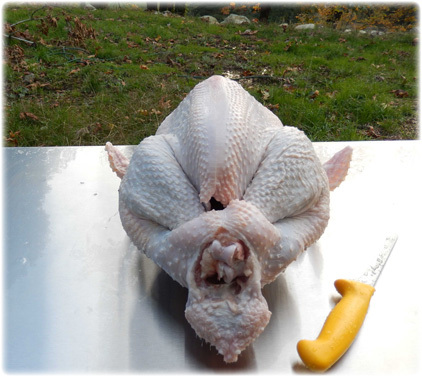 The turkey goes into it after it has been killed. 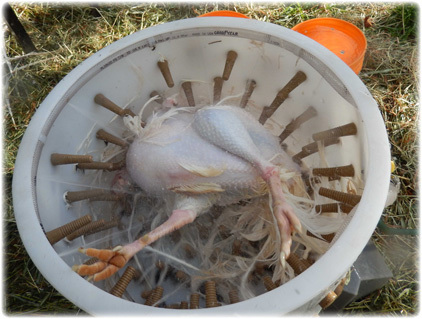 This electric plucker quickly pulls out the turkey's feathers. Now the turkey is plucked and ready for evisceration. The finished bird - almost ready for roasting. On the table and ready for Thanksgiving.